If you are a business owner, you need to realize the massive potential source of customers that the Internet can offer you. People simply don’t use resources like the yellow pages much anymore – they'd much rather take to the internet and do a quick search. Thankfully, building a website is not nearly as difficult as it used to be. In fact, it’s downright simple if you have the right tools at your disposal. This is where ColorLabs comes into play. ColorLabs, also known as Color Labs, is a web development firm that produces a variety of restaurant WordPress themes, as well as themes covering a variety of other niches. These themes allow you to make professional looking websites within an hour or less! Now there are a lot of web development firms out there, many of whom make restaurant WordPress themes. So what makes ColorLabs different? For one, every theme that ColorLabs releases is simply beautiful. They employ great designers to help them focus on the looks of the website, while their developers work on the specifics behind the scenes. ColorLabs also uses all the latest technology to make their themes “future-proof”. For example, all of ColorLabs’ WordPress themes are fully responsive, meaning they work great on all internet browsers AND on mobile devices such as smart phones and tablets. As more and more people use their mobile devices to shop and browse the Internet, having a mobile-friendly website is becoming more important by the day. 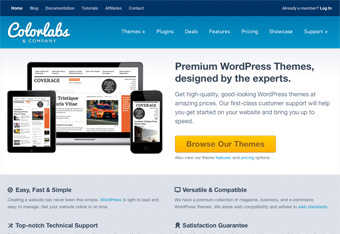 ColorLabs offers themes that are geared towards a number of niches. However, all of their themes are flexible and customizable enough that they can easily be changed to fit just about any type of website or business. They also offer great customer support, should you run into any problems with the theme down the road.